Bring 1 1/2 cups water, sugar, and corn syrup to a boil over medium-high heat in a large saucepan. Cook, stirring frequently, until the temperature reaches 240 degrees F (115 degrees C) on a candy thermometer. Set aside and keep hot. Stir together orange juice and orange zest, sprinkle with gelatin, and set aside. In a small bowl, dissolve corn starch in 1/2 cup cold water, then stir into hot syrup. Place over medium-low heat, and simmer, stirring gently, until very thick. Remove syrup from heat, stir in orange juice mixture. vanilla, and pistachios. Sprinkle a 8x8iinch pan generously with confectioners sugar. 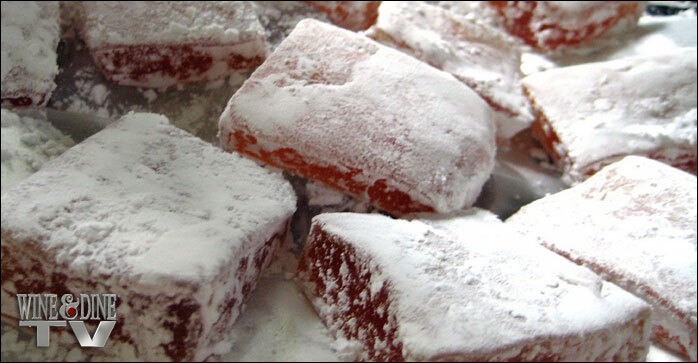 Pour the Turkish delight into the pan, and let cool in a cool. dry place (not the refrigerator) until set, 3 to 4 hours. When cool, sprinkle the top with another thick layer of powdered sugar. Cut into 17inch squares, and dredge each well with confectioners sugar. Store at room temperature in an air tight container.